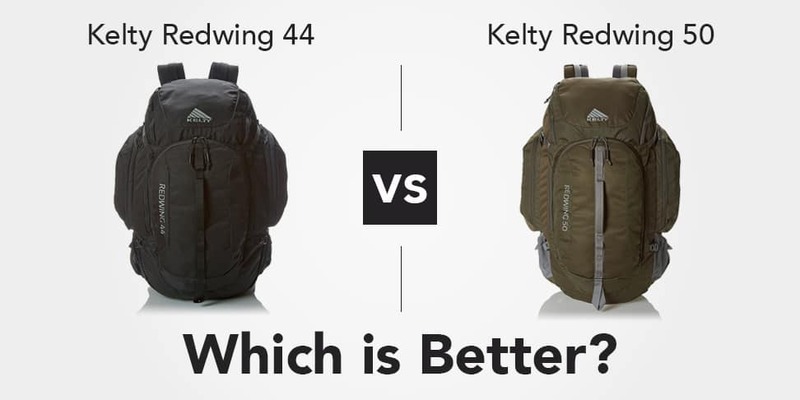 →Kelty Redwing 44 Vs. 50: Which Is Better? Kelty Redwing 44 Vs. 50: Which Is Better? One of the essential must-have gear for outdoor adventures is the right backpack. The Kelty Redwing collection produces some of the best quality and durable, rugged bags. The Kelty Redwing 44 and 50 are some of the brand’s most popular backpacks. However, all the Kelty bags come packed with the necessary functions and features you want out of an outdoor backpack. Given their significant amount of similarities, it can become somewhat challenging figuring out whether to go for the 50 or the 44. To get you closer to making the decision, we put together a comprehensive review comparing the Kelty Redwing 50 vs. 44. Apart from having one of the coolest names out there, the Kelty Redwing collection of backpacks mean business. They are what the real adventurer needs to pack up a few necessities and set out to the great outdoors or travel. With a myriad of rugged applications in mind, the backpacks come packing nothing short of the best features to deliver quality performance. The company has its headquarters in Colorado, smack in the middle of the state of adventure. They pride themselves on producing quality outdoor gear since 1952. All the bags feature an endless number of utility pockets placed conveniently around the exterior and interior. They also come in various sizes to meet different needs and therefore making them versatile to use as everyday backpacks. Much like all Kelty Redwing backpacks in general, the 50 and 44 come designed to handle rugged adventures. They come stashed with more storage pockets than anyone could ever need. Amongst the highly functional pockets included are a water bottle pouch and a hydration sleeve that also doubles up as a laptop pocket. Side compression straps add to the overall stability of the units when packed to maximum capacity. Best yet, the bags also feature utility loops to hold poles and tools that you might want to take on your trip. The two backpacks look very much alike at first glance because they make use of 420D polyester fabric for their body and 75 by 150D Tasser Coal reinforcement for the accent material. The two also incorporate the Kelty perfect Fit suspension system which includes a centrally placed aluminum stay at the back which gives a decent torso allowance. Also, they feature a padded HDPE (high-density polyethylene) frame. Both models make use of a U-zipper design enabling hybrid loading allowing the bags to function as top and panel loaders. These are just the standard features and functions all the Redwing backpacks come with, and each model includes additional extras that make them truly unique. Let’s not beat around the bush. Unfortunately, there are far too many outdoor gear manufacturers that are advertising bells and whistles related to their products. In order to stand apart from the competition, some companies might add a new exterior pocket that is essentially useless, though it does make them different. Whether you are planning to use your backpack for travel or for serious hiking, the most important consideration is related to volume. How big do you need your backpack to be? Learning how to correctly size your next backpack purchase begins by knowing your needs. While overpacking is certainly a common mistake of world travellers and hikers, one of the first thing you need to think about is where you will be travelling. Water is heavy and bulky, but it is also a necessity. If you will be away from a potential water filling station, chances are that you will need a larger volume pack to accommodate your extra water needs. Similarly, opting for the largest volume backpack (say a massive 60 liter pack) will most likely mean that you bring along extra stuff to “use up” the space that you have. Understanding your personal needs and the context of where you will be hiking and travelling will help you to discover the best size pack for you. What Differentiates The Kelty Redwing 44 and 50? The Redwing 50 is the larger of the two bags, and it also weighs 1lb heavier than the 40. It is not the most significant difference, but the stringent backpacker might consider it a dealbreaker because they always want to limit their carry weight. On the flipside, the upgraded size of the Kelty 50 means that it offers more carrying capacity. The 44 model as implied can accommodate 44 liters of gear while the 50 model can handle 51 liters of gear. When deciding based on size alone, you must figure out whether you need the additional 7 liters of gear capacity. The 44 model already proves larger compared to the regular daypack that usually comes with a 35-liter capacity. However, the Kelty Redwing bags are at first weekend/adventure bags which explains their size. Also, consider which model allows you to travel with it when filled up as a carry-on, and the 44 would win this one. When carefully scrutinizing the two models, one aspect that often almost goes unmentioned is the fact that the 44 lacks a zipper locking mechanism. It is a crucial difference because it means that you would have to go for the 50 if your adventures include travel on public transport. The 50 includes this security feature which gives you the peace of mind that your items are safe when you check the bag in or place the pack in overhead storage cabins. There is a negligible price difference between the two, with the 44 going for an estimated $119.95 and the 50 between 101.69 to $124.95. The Kelty 50 bags come in a selection of two sizing options which explain the price margin. Regardless, the $5 difference does not make a strong case for going for one over the other. The 44 features a 420D polyester fabric construction with a 75 by 150D Tasser Coal reinforcement. It is a multi-purpose backpack. The bag includes a load lifter strap. The bag comes with multiple organization and convenience pockets. The dimensions of the bag are 22 (L) by 15 (W) by 12 (H) inches with a 44-liter volume and 3 lb 3 oz overall weight. Anyone who gets their hands on the Kelty 44 can appreciate the multiple pockets thoughtfully integrated into its design. The utility loops allow you to store long items such as walking poles and tripods, and it also comes with an ice ax loop. Mesh pockets can accommodate water bottles, and a flat back-placed compartment features organizational pouches for small electronic devices, documents, pens, and other personal items. A top-placed pocket allows you to store quick-access items such as rain jackets or food. Not to forget the laptop sleeve tucked away inside the bag which also functions as a hydration sleeve. Some of its other standout features include the adjustable 1/2 inch padded shoulder straps with stretchy side sternum straps. It allows for a 14.5 to 18.5-inch torso fit. The Kelty 44 is a backpack for the outdoor adventurer who goes out on day-long or even week-long excursions. It suits hikers and backpacking because of its amply sized capacity and significantly lightweight frame. It can flexibly function as an everyday backpack for the individual who is always on-the-go. For instance, imagine any member of a film crew using it to carry their gear. The bag features a 420D poly construction with a 75 by 150D Tasser Coal reinforcement for the accent fabric. It features a removable hip belt. The Kelty 50 features multiple pockets for various applications. It comes in a selection of four color choices. The dimensions of the bag are 26 (L) by 16 (W) by 12 (H) inches with a 51-liter capacity and 3lbs 11 oz weight. The small/medium size option measures 24 by 15 by 12 inches with a 49-liter capacity and 31bs 3oz weight. Just like the Redwing 44, the Kelty 50 has a lot of pockets. The side, top, front, and back pockets use zippered closures. A sizeable front-placed pocket features organization compartments. A side water pocket and a hydration sleeve that also doubles as a laptop pouch will keep you conveniently hydrated. It uses an HDPE frame sheet and an aluminum stay to take the load off your shoulders. A removable hip belt, waist belt, and adjustable sternum straps also help to stabilize the weight as well as customize the fit. The Redwing suspension coupled with the back panel and harness padding makes it more comfortable to carry this bag. A carry handle makes it more comfortable and convenient to grab the pack from wherever you have stored it when you are on-the-move. The larger model allows for a 15.5 to 21-inch torso fit. Given the substantial 51-liter capacity, this backpack is suitable for the long-trip camper. Its size makes it too bulky for the regular hiker or backpacker and makes more sense for an adventurer who does not intend to move around too much. However, the upgraded secured zipper closures make it the backpack you want to give you peace of mind whenever you are using public transportation. Think about it; the backpacks go through a fair share of abuse right from when you start packing up for your adventures. They spend a significant amount of time on the floor, stowed under beds or storage cabins, and strapped on your back as you go along your way. If you get anything short of a superior backpack, you should prepare yourself to spend more on regular replacements. The primary difference between the two Kelty backpacks is their size. The 44 already gives you enough room to carry what you need for those weekenders in addition to multiple convenience pockets. However, if perhaps you are a long-trip adventurer who does not need to set out on foot too much then the extra room proves quite handy to handle extra gear. Security matters most in most situations, and the last thing you want to deal with is losing prized possessions out on a trip. That makes the Redwing 50 more desirable because of the locking mechanism it features on its zippers. Finally, it comes down to your preference because you stand to end up with a quality backpack whichever option you choose.